Overlooking the Mediterranean sea, nestled among 3 hills and their valleys, is the beautiful, old town of Safita, Syria. 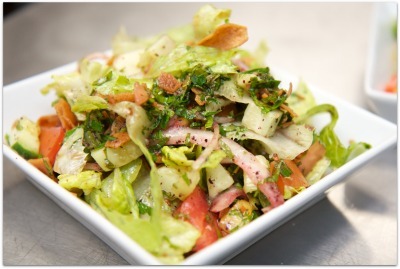 Only a few miles from the long island sound, nestled between Westport and Fairfield proper, is the beautiful, month old middle eastern restaurant, SAFITA. It is the "Tale" of two Safitas, both with their charm, beauty, and authenticity. 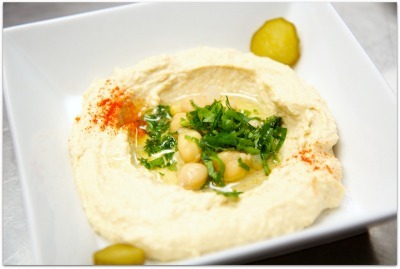 And it is just this authenticity that Kheder Hassoun and his family bring to this brand new Middle Eastern restaurant, situated where the old Chat 'N Chew used to be. Tiny in size but big in hospitality, Safita, at 2217 Post Road in Fairfield is pulling in the crowds, night after night. This is middle eastern at its finest, with "Ummu" ("mother" in Arabic) Amal in the kitchen, cooking up all her own recipes from scratch. 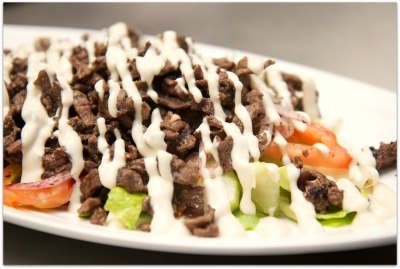 This ain't your roadside Shawarma. 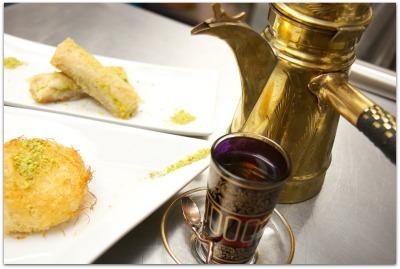 Indeed, the Hassoun family is new to the restaurant business. Kheder and his sisters Ranan and Maya help run the establishment while mom, Amal, coaxed into opening a restaurant by friends and family who loved her cooking, stirs, spices, creates and prepares all the delights that her native country offers. But what makes Syrian food special? Syrian food is the diffusion of the cultures of civilizations that settled there and thus gets a lot of its influence from Persian and Turkish cuisine and resembles Lebanese and Palestinian cooking a great deal. 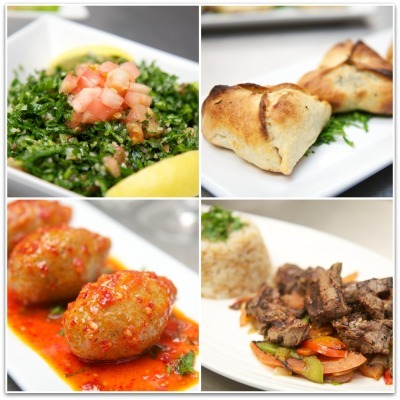 Whatever middle eastern delight you may seek, Safita has it all. And you feel that you are there, in that town, on those hills, overlooking that sea. As soon as you walk through the doors, you are transported. Although the space is small, seating about 45 people, this allows for a cozy welcome. The windows are draped and the ceiling is covered with dark, red tiles. The wooden floors are warm and the gilded tiles that separate the kitchen from the dining area sparkle and reflect the many Hookah pipes that decorate (and ONLY decorate, we're told) the space. If you have to wait for a table, and many were happy to wait the night we were there, there is a comfy sofa, complete with pillows, to rest your hungry bones. To start the meal, we were served a classic ZATAR, a mixture of dry spices, that clung perfectly to the pita after a quick dunk in some earthy olive oil. The spices - sumac, toasted sesame, salt, pepper, and oregano- were a jolt to the tongue, though not an assault by any means. I thought of it as a wake up call, "Reveille" for the taste buds! So now the mouth was awake. Time to eat! Next on our list was an order of CHEESE FATAYAS. 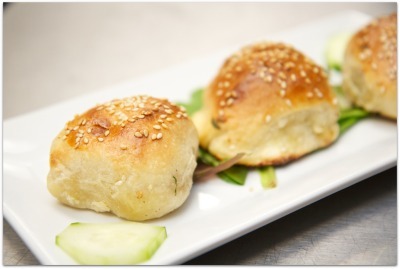 These were sesame-topped buns, filled with a blend of sweet and flavorful Syrian cheeses. All the dough at SAFITA is home-made and as we took our first bites of these FATAYAS, we knew that Amal had the baking down to a science. The dough was flaky and light, and dipping the FATAYAS in deep red Syrian hot sauce made these simple buns come to life. What makes this hot sauce so special? The answer I got was, "crushed red pepper, vinegar, and the rest is a secret..." I promised that their secret would be safe with me, but no dice. I'm kind of glad they didn't divulge. It added to the magical quality of our experience. Onward! We sampled the VEGETARIAN KIBBEH next, a cracked wheat shell stuffed with tender, sweet spinach and a chick pea medley. Again, Amal's baking shone; the delicate and flaky structure of the cracked wheat case melted into the vegetable mixture with each bite. 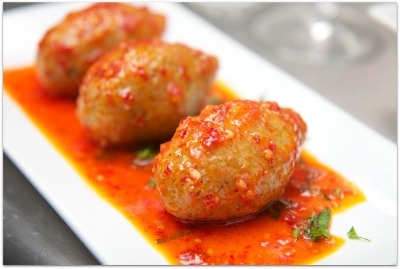 Carnivores - there's BEEF KIBBEH if you prefer, accompanied by tender pine nuts and onion. Don't forget the "secret sauce" here as well. It's a MUST ADD for all of us who demand "zing." 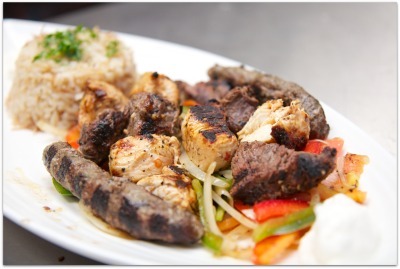 Top of the line as far as I was concerned was the SAFITA MIXED GRILL (seen above). Here, tender chicken, beef filet, and an amazing lamb sausage were served over rice and grilled veg. The lamb had been marinated for two days, then broiled, then grilled, then ground and mixed with peppers, onion and garlic, and then packed in their casing. These sausages rocked! And of course, all the usual suspects, disguised as condiments, were present: the HUMMUS was good, not amazing; the TAHINI was rich and flavorful; the CREAMY GARLIC sauce was, well, creamy and garlicky. All were wonderful dipped in the PITA that the crew at SAFITA have trucked in from a famous Middle Eastern shop in New Jersey - the local store brands just don't compare. And a true stand-out in this category was the GRILLED EGGPLANT. This was par grilled and then pureed, served with green pepper, tomato, parsley, lemon and garlic. 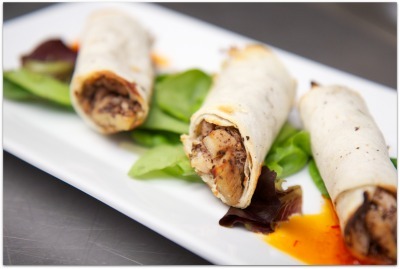 Amal has the proportions just right in her recipe and the result is smokey and superb. Last but not least, the BAKLAVA: small rolls of phylo which were surprisingly not cloying despite the moist honey soaked dough. There were plenty of rich pistachios inside which probably contributed to the fact that, while I'm thoroughly DONE with Baklava after three small bites, I was able to lick this plate, clean. Another interesting dessert was the KENEFEH, shredded crispy phylo with lightly sweet cheese inside. The cheese was just firm enough, soft yet not runny. Again, flavored with honey and a dusting of pistachios, this dessert had a pleasing crunchy exterior which juxtaposed nicely with the mild, sweet cheese inside. SAFITA is a real find in this part of Fairfield County. FInally, authentic Middle Eastern in a comfortable setting with delicious food and an incredibly friendly staff (go, Gretchen!) The restaurant is open for lunch, dinner and take-out and might be my next go-to destination for catering. The Hassoun family is doing Middle Eastern right!